Every time we look at WorldView-3 and WorldView-4 (WV3/4) imagery, we are blown away. And we hope you are equally impressed with the data! 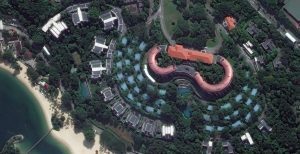 Last month we fittingly explored a colorful town in South Korea, and for the August WorldView-3/4 Image of the Month we feature an image of the Hotel Capella in Singapore – the site of the historic US-North Korea Summit in June 2018. PLEASE NOTE: Effective May 2016, WorldView-3/4 prices dropped again! Are you interested in finding out more about these price drops? If so, send us an email at sales@apollomapping.com. Higher resolution means you can see more detail in WV3/4 imagery. Data collected at nadir will have 31-centimeter (cm) panchromatic, 1.24-meter (m) visible and near infrared, 3.7-m SWIR (WV3 only) and 30-m CAVIS (WV3 only) bands. Per US government regulation, all WV3 SWIR orders are produced at a maximum resolution of 7.5-m. CAVIS bands are not available for purchase at this time. With accuracies of 3.5-m CE90% or better (without ground control even! ), WV3/4 has no rivals for its enhanced positional accuracy. At 40 degrees latitude, WV3/4 will each be able to image every location daily with 1-meter or better resolution and then every 4.5 days at 34-cm resolution or better. WV3/4 feature 13.1-km swath widths (at nadir) with the ability to collect up to 680,000 square kilometer (sq km) of high-resolution data per day per satellite. If you are interested in WorldView-3 and/or WorldView-4 imagery for your next project, please let us know by phone, 303-993-3863, or by email, sales@apollomapping.com. You can also find more WV3 samples and technical information on our website here and then WV4 samples and information can be found here. This entry was posted in The Geospatial Times and tagged monthly spotlight, North Korea, The Geospatial Times, WV3 by Apollo Mapping. Bookmark the permalink.